Some:when is a long term collaborative public art project that was conceived in response to the floods on the Somerset Moors and Levels. 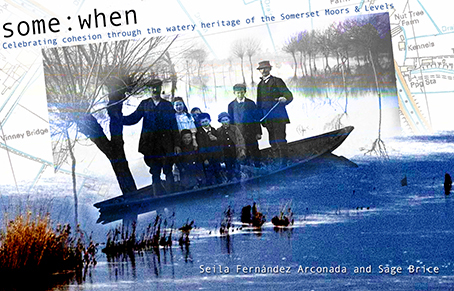 Artists Seila Fernández Arconada and Sage (formerly Jethro) Brice worked together with individuals and community groups affected by the floods, creating a replica of the Somerset Flatner – a traditional boat designed as a practical and affordable solution for navigating life in a changeable environment. Through creative workshops and events, participants were encouraged to share and reflect on their experiences, and to articulate visions of Somerset’s future. The Flatner has featured in a number of exhibitions and events across the Southwest, and is currently installed at the Royal West Academy of England as part of the Imagined Landscapes exhibition. This characteristic Somerset boat is an iconic local design that represents the centrality of both water and human ingenuity in shaping the history of life on the levels. The boat was built using a mix of reclaimed and new materials, generously donated by local individuals and the Langport branch of Travis Perkins. The project began in 2014, funded initially by a grant from the Somerset Community Foundation This was extended through a successful Kickstarter campaign and other donations, and the project continues to seek funding and support to develop and evolve. The aim of this long-term engagement is to support and amplify the remarkable resilience of Somerset communities in responding creatively to the floods. While the Media have often presented the floods as a matter of division and controversy, we have been struck by the voices from the ground which have worked to develop shared responses to the crisis. The Some:when project team would like to say thank you to everyone who has taken part in the project so far, to the people of Langport and the Parrett environs for the enthusiastic responses and support they have offered, and to all who have shown an interest, locally and internationally. Watch this space for future developments! Please use the menu above to follow the development of the project, or to join the conversation. For regular updates enter your e-mail on the right, and click ‘follow’. Finally – use the #somewhen hashtag on Twitter to add your comments to our live feed! Daresay you have come across “Working Boats of Britain” Eric McKee, Conway Press? There are some good drawings of Flatners in there. A straightforward boat to build. Thank you, yes, it’s one of our best references. We chose the boat for its simplicity and functionality. Now working on finding a place to build it! Just to say what a delight it has been to spend a week with Jethro and Seila working on the boat,conditions have not been always comfortable but still they worked late into the cold nights cheerfully and with great precision. Very much looking forward to their return. It was definitely an enjoyable week and a job well done. Very much looking forward to continuing!